Nikon, Olympus, and Sony have now reported their third quarter results. Analysts weren't overly impressed. Nikon's stock dropped 18% following their results announcement, despite the fact that Nikon announced a profit. Both Olympus and Sony reported serious losses in their imaging groups. Nikon first: the big issues here were reduction in average selling price per camera, suspicion of inventory buildup, and Nikon's reduction in forward projections of camera sales. While compact camera sales (Coolpix) represented a phenomenal 24% of the overall market, Nikon's interchangeable lens camera market share slightly slipped. Coupled with the lower average amount received per camera, this didn't impress the financial experts. It's unclear how Nikon will grow moving forward. Even Nikon was pulling back their forecasts a bit. Given the big drop in profits and the miss on expectations, Nikon is no longer the darling of the analysts in the camera business. Actually, no one is. Nikon was the one remaining hope that someone could show positive results across the board and meet their number expectations. Didn't happen. Still, it appears that Canon and Nikon have the only profitable Japanese camera businesses left. The picture at Sony isn't particularly good. Sony has nine basic divisions (imaging, game, mobile, home, semiconductors, motion pictures, music, financial services, and other). Of the consumer electronics groups (the first four), only gaming (Playstation) showed an operating profit. Wrap your head around this: the money makers for Sony are content and financial services, not hardware products. Camera sales decreased, mostly because of compact cameras, but Sony reported that they sold more interchangeable lens cameras year to year. 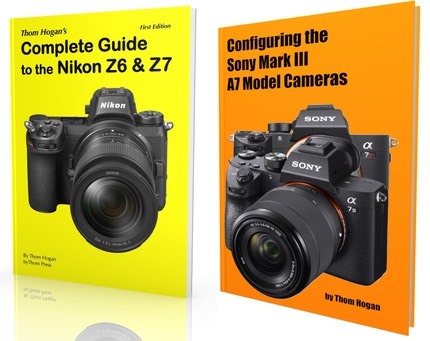 Questions asked by the business press didn't get them reveal the exact DSLR/mirrorless mix Sony had, but Sony did indicate that NEX sales were a strong part of the reason why they showed a gain in interchangeable lens cameras during the year. Still, there was an operating loss of US$33 million in the group for the first nine months they've reported for this fiscal year. That's a strong reduction from last year, but it's still a loss, and Sony didn't mince many words about what further declines in camera sales might produce. Indeed, they pointed out that they forecast a continued loss in the current quarter and they've lowered their last sales forecast (made in November). At Olympus the numbers were ugly. At least for cameras. Their endoscope business continues to do decently, as does the information and communication group, both of which are bigger than the imaging group. The imaging group reported 17% lower sales than last year, and the loss in operations more than doubled. Mirrorless camera sales for the year rose 12% (28% during the last quarter of the year), but there were a bunch of little footnotes that some analysts picked up on: digital camera inventories grew 22% year to year, Olympus has doubled the projected loss for the year in imaging from their last estimate, and the words "further drastic reform is under review" was associated with the imaging group. Maintaining market share in a declining market isn't going to help anything: it just means that your unprofitable group just sells even fewer cameras. Remember, CIPA's forecast for what would be the next data point on that chart is even lower. 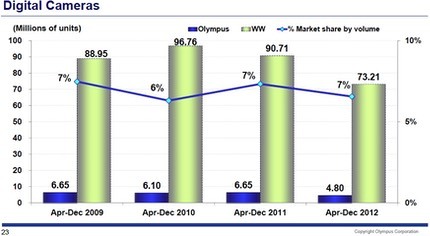 Olympus' inventory of cameras grew, which means they weren't able to sell the product they already made. Indeed, really close examination shows that Olympus took a US$39 million "impairment charge" in the imaging group, which some believe is a write-down in inventory value. The two largest camera makers reported profits: Canon and Nikon. Both reported declining profits. The next four largest camera makers reported losses. Inventories of cameras built up at most of the companies. Average selling price per unit went down at all companies that reported it. Market shares aren't moving much as the overall market volume declines. This is a heap of bad news. Basically every company has serious problems they're facing in selling cameras.